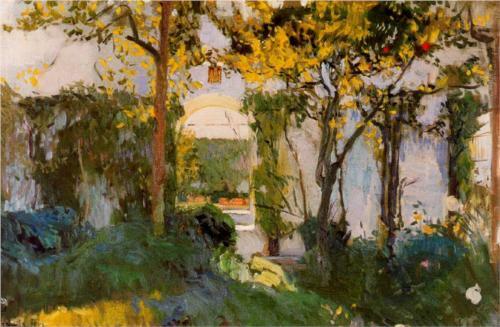 Antiquo jardín del Alcázar de Sevilla (Joaquín Sorolla), 1908. Writers, dreamers, poets and artists have thought long and hard about gardens for centuries—and so have the more religious and practical among us. At least I imagine they have because I’ve studied such things, but I’m far from certain. So often nowadays I find that these real characters of history are just as real to me as any who are fictional. I guess I’ve grown and that fine line is no longer there. It all blends together. It’s all a pastiche. I’m not religious myself, but I was raised in a Catholic family, went to Catholic school for 12 years, and I now consider myself Catholic by culture. That’s how I ended up visiting España with my parents back in my early 20s. Dad wanted to go there for 10 days to take photos of churches and to visit the region of Estremadura. The three of us traveled south from Madrid during the month of December and I’d like to say that I remember a lot more than I do, but I spent most of my trip feeling unwell. At night my dreams were in Spanish. (Back then my Spanish-language fluency was much better, although that had never happened to me before and it felt strange—yes, foreign.) During the daytime, my mind wandered back-and-forth in the backseat. I felt between worlds. As we drove I thought a lot about what a cousin had recently told me concerning our Sicilian ancestry. He’d researched our family as part of his Master’s thesis and had found that one of our earliest relatives was actually a Morisco from Spain. Fresh in my mind was the way my father had vehemently been unable to accept this discovery. Today he’s softened and has accepted that it’s likely true, but at that time, it dramatically altered how we saw ourselves. 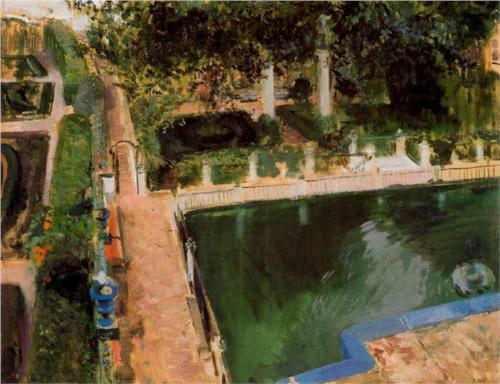 Jardín de Carlos V en el Alcázar de Sevilla (Joaquín Sorolla), 1910. Before I knew it we were in the beautiful city of Sevilla. We stayed there for a few nights and went to several museums, a Flamenco performance, we ate delicious food, and then one day, while walking around on my own, I stumbled upon the Alcázar of Seville. I went inside. The gardens of the Reales Alcázares de Sevilla changed me. I think I was transported there away from myself. They were—and still are—my dream gardens. It was there I felt so many new and wonderful things as I saw plants that seemed so unreal to me. I felt so alive and so awake. In many ways it felt more like home to me than my own home. I had never felt that way before and I haven’t felt that way again. To me that’s what a dream garden is about and it’s what we seek to make when we design gardens. We want what I can only describe as being a kind of religious experience. Like in meditation, we consciously count our breathing until we transcend and forget ourselves. We want gardens to give us that kind of rush too. It’s deep. I know. It seems very much connected to something inside of us that’s human. Many of us crave this feeling. It’s spiritual whether we like to admit it or not. It’s calming. It’s soothing. To Christians, it’s a return to Eden, and to those who follow Islam, it’s called Paradise. In Arabic the word is جنّة or Jannah—and that’s short for garden. That day in Sevilla I felt like I’d visited Paradise. Ever since then, as a gardener, I’ve wanted to recreate that feeling. That has been my dream. I enjoyed reading this, this little bit of insight into who you are a a gardener. I don't know if I've ever encountered a garden that was a dream garden. I've seen a couple that I've loved a lot, and that inspired me.